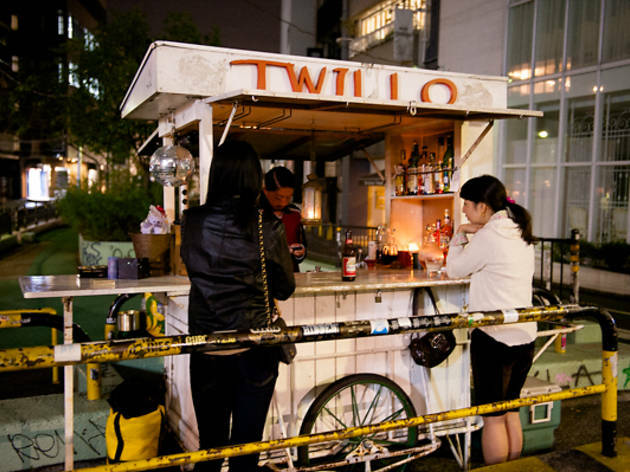 If you ever happen to spot a lightly worn-down, white cart stacked full of alcohol on your nightly adventures, be sure to stop by for a drink: in a city full of curious watering holes, Twillo is one of the most eccentric. 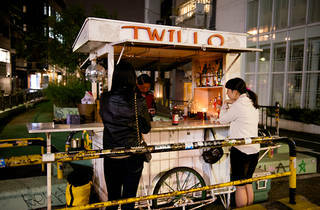 Serving a snappy selection of beer, wine, spirits, cocktails and Cuban cigars out of his truck, the owner is on a never-ending journey around Tokyo, always setting up shop somewhere in the city around 10pm and staying put until the following morning. The only way to find him is through Twitter, where he reveals his location for the day. Twillo doesn't even stop running for winter – on the contrary, the cold months see the drink selection complemented by glühwein, spiced rum mixtures and the like.